A depiction of the wise virgins (Matthew 25:1-13) illustrates the mass for virgin saints or the Common of Virgins. 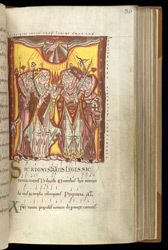 In two groups of four, the virgins hold a torch and two lamps, evoking the parable, and branches, which may represent palms of martyrdom to indicate heavenly status. References to the parable of the wise and foolish virgins and the hand of God above urge readers to prepare for the Second Coming. Although related images of the 'choir of virgins' are known in medieval liturgical books, this is unique in its adaptation of the parable's imagery.